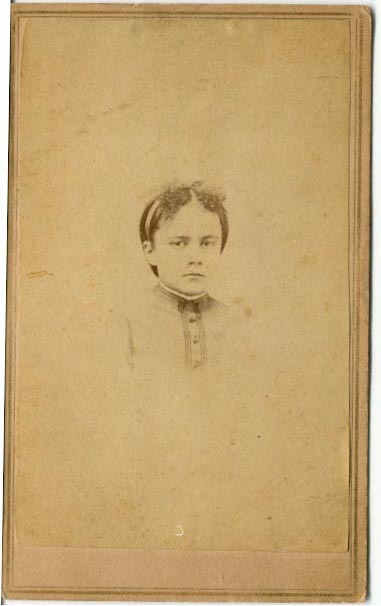 These are photographs, courtesy of Nancy Benton, which had belonged to Caroline Atwell Noyes, child of Hiram Atwell and Rachel Scagel. The backmark on this Cartes-de-visite image shows it was taken at the studio of R. M. McIntosh in Fairfield, Washington County, Vermont. Image courtesy of Nancy Benton. 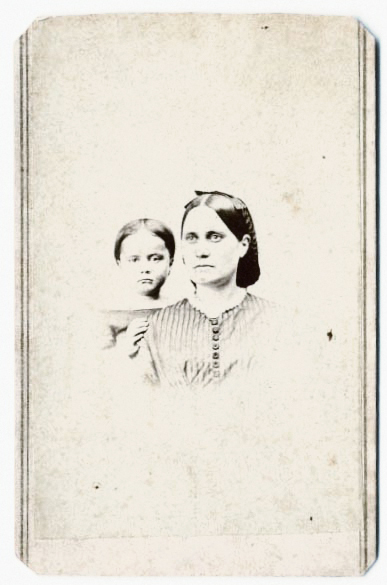 The backmark on this Cartes-de-visite image shows it was taken at the studio of R. M. McIntosh in Fairfield, Washington County, Vermont. There being no ID on the photos, Nancy Benton had initially supposed that the photo of the girl and woman night be Caroline Atwell Noyes, as a child, with her mother, Rachel Scagel Atwell. 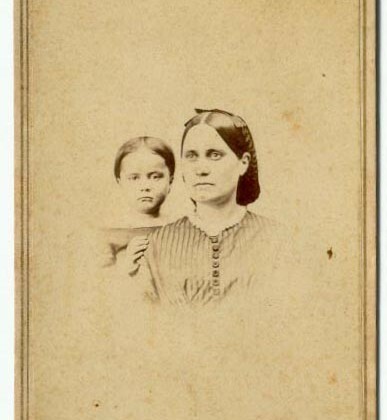 The clothing and hair styles appear to me to be from the 1860s, and Rachel Scagel died in 1843, far too early for these photographs to have been made. 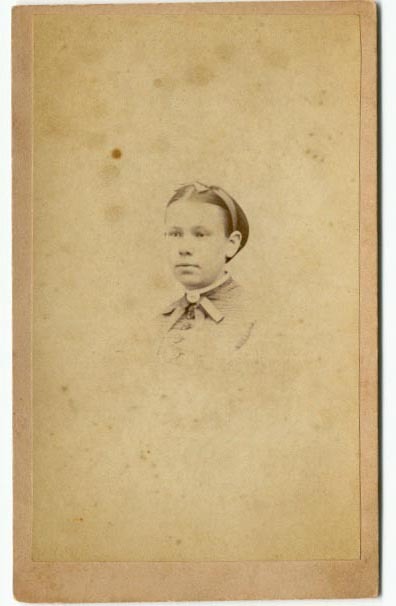 This is another unidentified Cartes-de-visite image from the possessions of Caroline Atwell Noyes. 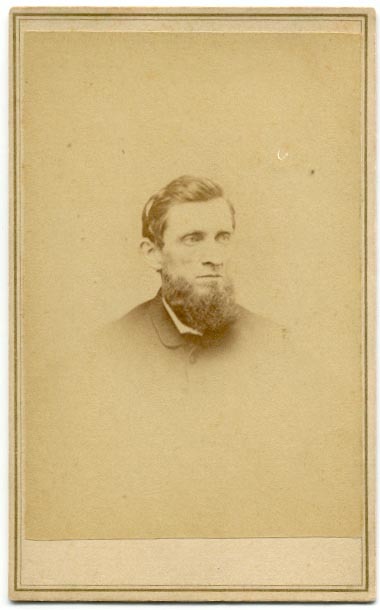 Nancy Benton had initially identified the photo as perhaps being Hiram Atwell, Caroline’s father. 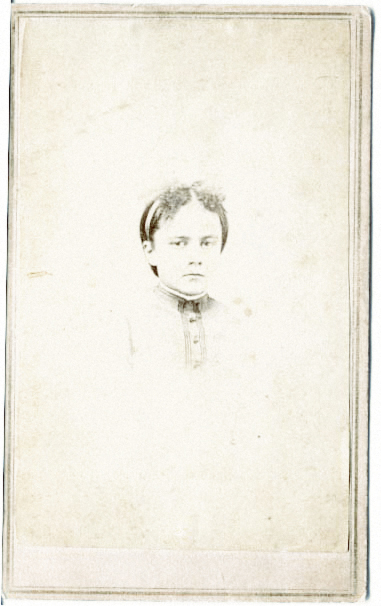 Having since received, however, a photo of his brother, Asher, we instead believe it is possibly a photo of Asher Atwell in younger days, but there is no positive identification. The photo was taken at R.M. McIntosh in Northfield, VT. The McIntosh studio produced Civil War photographs and were also in The Montpelier, Barre, Waterbury And Northfield Directory 1887-88. I read that the R. M. McIntosh studio was that of Reuben McIntosh. He was born in 1823 in Bethel, VT, first was engaged in the business of photography in Bethel, then moved to Northfield in 1853. Is it possible the woman with the child is Asher’s wife, Charlotte, and the firl is one of their daughters? The woman’s eyes are deep set enough to be Charlotte’s, but it’s difficult to tell otherwise. 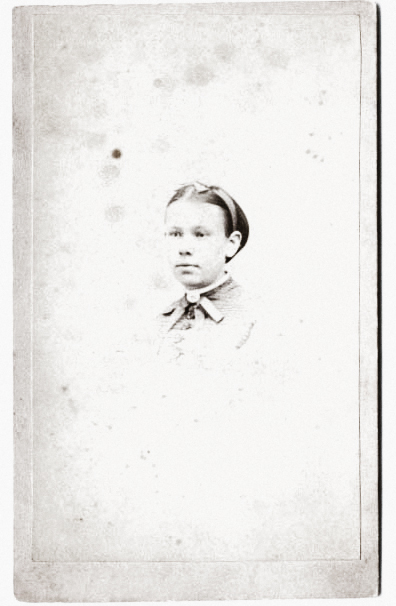 Mary was born abt 1855, Arvilla in 1856 and Lowella in 1857. The girls in these images are spaced much farther apart in years, the oldest one in the bottom photo appearing as if she could be anywhere between 12 and 15. Frustratingly enough, as it stands it’s impossible to make an identification of the woman and children.